There’s so much to do in Columbus when the weather is nice, but the winter months seem to take forever, with a range of temps from cold to colder. There’s still so much to do in the winter in Columbus, and plenty of it is free and cheap. There’s always plenty to do over the weekend, and each week we give you a whole list of fun with our Free and Cheap Events this Weekend in Columbus. Got snow? Check out the best sledding hills in Columbus for some snowy fun. Ice skating is great exercise! There are several options for Indoor and Outdoor Ice Skating in Columbus. Hike at any of the Columbus Metro Parks or Delaware Preservation Parks – they are totally different in the winter season, and beautiful and peaceful in a special way. Skiing, Boarding, and Tubing can be a little expensive, but there are specials that can make it more affordable. Hitting the slopes locally will always save you money, as you won’t need overnight accomodations. Kids have a snow day? There are plenty of options for snow day fun! What comes after winter? Spring…and then Summer! Winter is the best time to get in shape, because – well…there’s less to do in the winter, and just enough time before bathing suit and shorts season comes around to make a difference in your confidence. Plus, it’s always better to be a little healthier than before, so work on creating great habits before it’s time for Easter candy! Free Fitness around Columbus in the Winter There are plenty of FREE indoor and outdoor options to help you get fit – no gym membership required! Metro Parks Annual Winter Hike Series Don’t let a little cold weather keep you inside. Pay-What-You-Can Cooking Classes with Local Matters can help you step up your game in the kitchen so you can make home-cooked meals and avoid the fast food and convenience food. Go swimming no matter the weather at these indoor community center pools. Some feature hot tubs, lazy rivers, and other fun features that are just for kids! Moving around in the water for an hour or so is great for anyone – no need to swim laps! Dublin Community Recreation Center ($3-$8 for daily admission) 5600 Post Road, Dublin. Lazy river, hot tub, waterslides, and more. Check link for leisure pool hours. Worthington Community Center ($5-$8, free under 3) 345 E. Wilson Bridge Rd., Worthington, OH 43085, Ph: (614) 436-2743. Lazy river and vortex and larger slides. Check link for leisure pool hours. Columbus Aquatic Center ($1) 1160 Hunter Ave. Columbus, OH 43201 (614) 645-3129 Must also get a $1 leisure card; good for 3 years. Hours: See schedule here. Roller Skating: It’s so much fun that it won’t feel like exercise! Go with a few friends, or take your family! There are sessions appropriate for various ages at each of the rinks. Skate Zone 71 near Morse Rd: Tons of skate parties with character visits. Little kids skate is on Saturday mornings. There are also discounted days, young teen nights, and adult nights. Teachers and a guest skate free in December and January with I.D. These fun and unique yoga classes will distract you from the fact that it’s a great workout! Workout your brain by taking advantage of Free Apple Workshops to learn to work your devices better. Whether you need to learn a new device from scratch, or you want to learn some cool tricks, they have a variety of offerings. Indoor Farmer’s Markets are a great play to wander, find some local goodies, and listen to music or check out other entertainment. Pick up something healthy while you’re there! Shop a Vintage Market or Barn Sale and discover a “new” old find! Short North Gallery Hop celebrates art, local shops, good food, and great people watching on the 1st Saturday of each month! Check out the Book Loft in German Village! It has 32 different rooms; you’ll love getting lost together while you explore. It’s no secret that Columbus is FULL of amazing local businesses, restaurants, shopping, attractions, and makers, and the Made in CBUS Trail is a great way to experience some of the best! Pick up a passport at any of the locations, and purchase something at four or more of the locations to get your passport stamped. Redeem your passport at an Experience Columbus Visitor Center for a free Made in CBUS T-Shirt! Wexner Center for the Arts offers FREE admission for exhibitions for everyone on Thursdays from 4 -8 p.m., as well as on the first Sunday of every month. Columbus Museum of Art offers free admission on Sunday and pay-what-you-want on Thursdays from 5-9 pm. Warm up with the stunning Orchids: Utopia exhibit through March 3, and after that catch a butterfly release at Franklin Park Conservatory, and explore the other amazing exhibits. Billy Ireland Cartoon Library & Museum at Ohio State has exhibits and programming that comic book and cartoon fans will love. It’s always free! Bank of America customers get a Free Museum Pass on the first weekend of each month. See if any shows are available at The Ohio State University Planetarium. The schedule for upcoming shows is usually released the week prior. Fun and Tasty Adventure Trails in Ohio There are options for grownups only, and ones that are family-friendly. Whether you want to go out with a group of friends, or have a date night with your love, we have some ideas that’ll keep things fun through the winter. Need a date idea that’s better than just dinner and a movie? Check out our list of 50+ Best free and cheap dates in Columbus. Play like a kid at LEGOLAND Discovery Center at Easton! Once a month, they host monthly Adult Nights where the grown-ups have the run of the place! Adult guests can enjoy all aspects of the 36,000 sq. ft indoor attraction, including the two rides, 4D Cinema and MINILAND, plus a cash bar! (typically the 1st Thursday of the month). COSI offers a once a month option for grownup fun! COSI After Dark give you the run of the place with themed-activities – and NO KIDS! Less than $20 to get in, and it’ll fill your evening with child-like fun! (typically the 2nd Thursday of the month). Happy Hours are the ultimate cheap restaurant experience! Dine early on tasty appetizers, have a drink or two, and head home to catch a movie on the couch! This happy hour list around Columbus is constantly being added to, and you can try a new place each week! Columbus Ale Trail: Travel the Ale Trail through Central Ohio and find a new favorite craft beer. Coffee shops make GREAT dates! Warm beverages, sweets, and cozy seating makes for a perfect cheap date! Complete the Columbus Coffee Trail by having a date at each place, and earn prizes! If cocktails are more your style, we have 2 options for you! Go on the Gahanna Herbal Cocktail Trail for herb-infused cocktails, or the Dublin Celtic Cocktail Trail for Irish-inspired drinks! Whether it’s Tuesday or not, Tacos make the perfect cheap date! The Columbus Taco Trail will take you to new and old taco stops, as well as the best taco trucks in the city. With 11 options on this trail, you’ll probably need a couple of days to hit all of the stops, or explore a new one each Tuesday for Taco Tuesday. Looking for more spice? Columbus Tikka Trail featured the best Indian food in Columbus. This list was compiled based on the locations chicken tikka masala, but there are so many delicious options. Take a short drive east of Columbus to the Licking County Wine Trail. Visit the 6 wineries and collect a stamp from each winery, bring your book to the Explore Licking County office to claim wine trail t-shirt (while supplies last). As a bonus, you’ll pass through the charming towns of Granville, Johnstown, revitalized downtown of Newark, and picturesque country outside of Heath. Want to drive a little further? These food and adventures trails in Ohio will keep you busy and give you lots of time to talk on your drives. Wine Tastings are a great and inexpensive way to spend an hour or two with friends or a date. Wyandotte Winery hosts Happy Hour Hump Day on Wednesdays and Fabulous Fridays to celebrate the weekend! Find new favorite wines or beer varieties at the Hill’s Market 10 for $10 Wine Tastings on the first Saturday evening of the month. Explore Whole Foods while you enjoy 5 after 5 Wine Tastings with wine (or beer) samples and small plates. Pick up something from the prepared food section and head home early for an evening cuddling on the couch. Meza Wine Shop in Westerville hosts inexpensive wine tastings and other events each week. House Wine Thursday Night Tastings are just $15, including flatbreads and cheese, and will get you ready for the weekend. The Bexley location of House Wine hosts Wednesday Night Tastings too! $10 for $10 Wine and Bourbon Tastings at locations all over the city on select Monday-Thursdays! The North Market is an amazing place to spend a day or evening exploring. There are so many great food options, you can grab a drink at The Barrel and Bottle. Pick a few food items from various merchants and share in the upstairs seating area or on one of the patios. Do something unusual! Check out Rocky Horror Picture Show at Studio 35 on the 1st Saturday of every month. With sicknesses and cold/snowy weather, it’s easy to feel like you’ve been trapped in the house for way too long. If the kids are healthy and the roads are safe, get out of the house while you can! Indoor Play Places in Columbus Sometimes is just too cold, or too snowy, or too rainy, and you just need to get the kids (and yourself) out of the house. Family Nights at Worthington Community Center is held on select Friday Nights, and features some great non-electronic fun that’ll wear the kids out. Home Depot Kids’ Workshops are held the First Saturday of each month. Kids can build a fun project for FREE! Michael’s offers Kids Club every Saturday from 10 a.m. – 12 p.m. where kids can do weekly craft projects for just $2. They also host Make Break events for older kids throughout the month. Most require small purchase to complete project, though many supplies are provided. First Friday Film Series are held at Ohio History Center on the first Friday of select months. Museum stays open from 5-9 pm, with special activities and exhibits, and a movie at 7 pm. Tour the Butler County Donut Trail at your leisure and earn a tshirt if you complete all of the stops – attempt it in a day (start early!) or head out over a period of weekends or months. Go for dessert and hit a new sweet spot each date to complete the Hilliard Ice Cream Trail. Need something sweet? Go on the Ohio Buckeye Candy Trail. Enjoy Ohio’s state candy – the buckeye! It’s peanut butter chocolate perfection. You’re going to have to drive a bit further to catch all 31 (!) stops on this trail that stretches throughout the entire state, but isn’t it worth it?! Who makes the best buckeye? Who cares?! Enjoy them all! There are enough stops near Columbus to do a mini tour. The Irish Fairy Doors of Dublin Trail: Pick up your Trail Guide at the Irish Fairy Garden in the Dublin Visitor & Information Center (9 South High Street) and follow the path on your trail guide through Historic Dublin to 8 different businesses to find tiny magical fairy doors. Find the name of each resident fairy, fill in your passport and return your completed passport to the Visitor’s Center for a FREE Fairy Doors of Dublin t-shirt. Hoot Family Film Series at Gateway Film Center: Held on the last Saturday of each month. Lobby activities for the first hour. Shazzbots will perform for dance parties between cartoon shorts sets in the theater starting at 11 am. Such a fun event for kids, especially ages 0-7. Free with canned food donation. Columbus Metro Parks offer programming year round, including the cold winter months. In addition to hikes and outdoor exploration, they offer indoor activities, and most offer open play activities (and a chance to warm up) in the nature centers. Go bowling! There are plenty of options, but here are a few nice suggestions for families. Check for coupons on the website – sometimes there are family packages that can save you money! Need something to do today?? Check out list to see what’s going on today in Columbus – or our whole calendar! 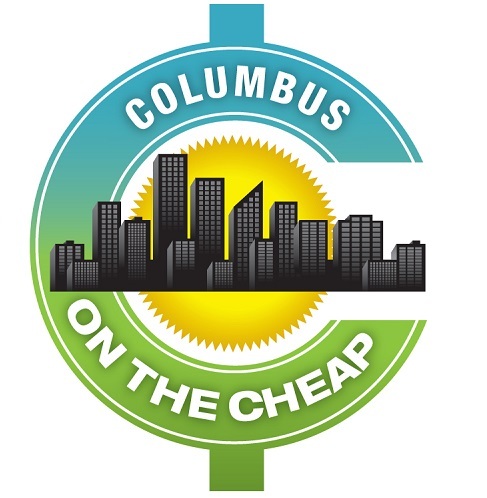 Make sure you don’t miss any upcoming deals by subscribing to Columbus on the Cheap’s daily emails (just one a day), and following us on Facebook and Twitter. Want us to highlight your business or event or give it a prime spot at the top of this list? Email me about sponsoring this popular post: info@columbusonthecheap.com.